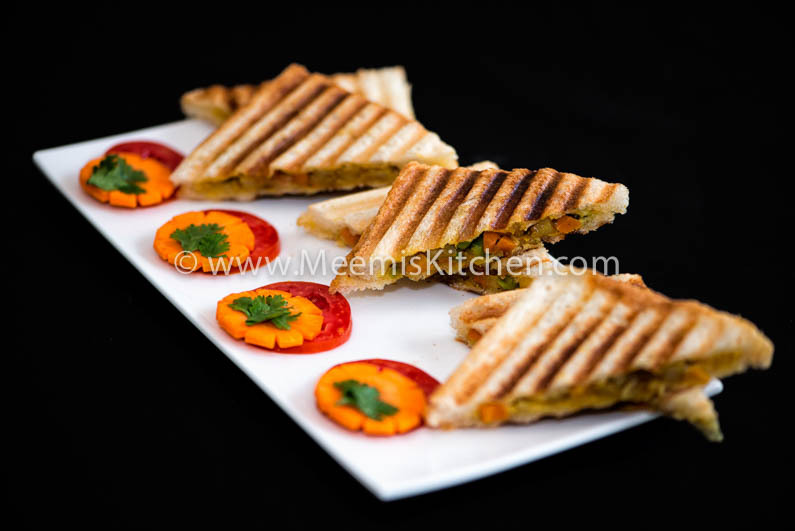 Grilled vegetable Sandwich is a very fulfilling quick meal that augments your energy level and is a great lunch option for school kids. My kids love this grilled Vegetable sandwiches and prefer it over other meals as they are less messy; a fulfilling meal and supplies them with all extra energy for school time. It is an extremely challenging job for moms to make the lunch box nutritious and interesting. I have tried variety Pulao; like Veg. Pulao, Corn Pulao, Paneer Pulao, Chicken Noodles, Chicken Pasta, Chicken Kathi rolls, Healthy chicken rolls, Veg. Sandwiches, chicken sandwiches, Rotis with side dishes etc. Planning a nutritious lunch can be tedious at times, especially if your kids are picky eaters. So, here is a wonderful easy lunch box idea for your little ones. This quick fix sandwich is quite easy and tastes awesome and are enjoyed by kids and adults alike. The vegetables are flavored with mild spices so as not to hamper their sensitive taste buds and the Mayonnaise or cheese spread makes it extra delicious and appealing. 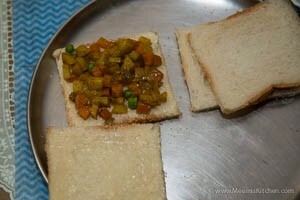 It is also a good option for a quick breakfast and also for tea time snacks. You can prepare the veg. filling the day before and refrigerate it and assemble and grill the sandwich the next day to save time. 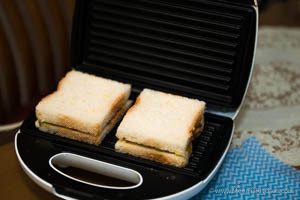 I have used electric grill sandwich maker for grilling; you can try in open grill or even sandwich toaster. Bread can be sandwich bread, or any other, white or brown bread of your choice. Hope you enjoy this grilled vegetable sandwich!! 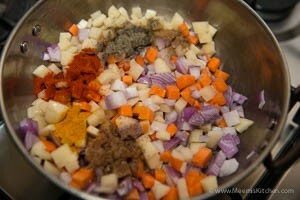 Mayonnaise/ Cheese spread : as required..
Chop the potato, carrot and onion into very small cubes. 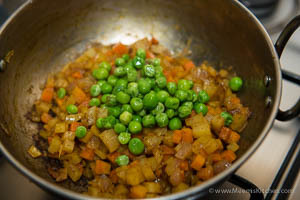 Heat a pan, pour oil and add chopped veggies and add salt and masala/ spice powders and mix well. Cover and cook on low flame, stirring occasionally. Boil the peas in little water, cook, drain and mix to the cooked veggies. Keep aside. Cut/ Trim the sides of the breads. Spread little Mayonnaise evenly on one side. Top with Veggie mix. Spread Mayonnaise on another bread and cover it with that bread slice. Place the sandwich in a preheated electric grill sandwich maker or your choice grill or tawa and grill the sandwich. Take out, cut into triangles and serve plain or with Tomato sauce. Your comfort meal is ready. Relish the delicious grilled vegetable sandwich. Bread can be sandwich bread, or any other, white or brown bread of your choice. You can use eggless Mayonnaise or other. Always choose a good brand of Mayonnaise to avoid extra sourness. You can try with Cheese spread instead of Mayonnaise or even with butter as per your liking. You can try grilling in an open grill or even tawa toasting. If your kids like it, let me know and share with your friends using the share buttons below. It will keep me motivated. Thanks and God Bless!! Thank you for subscribing MeemisKitchen. Please confirm your subscription in your mailbox. Share this recipe with your friends!